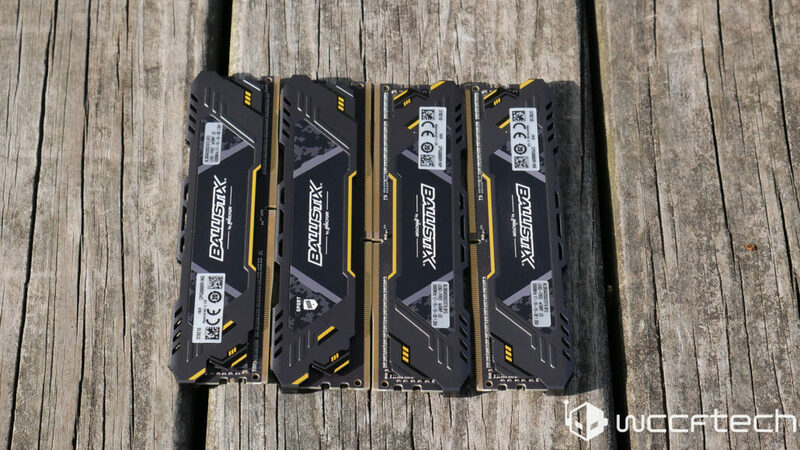 Crucial a subsidiary of Micron is one of the most well known and largest companies in the storage and RAM markets, they are known for their great customer warranty support and solid products. 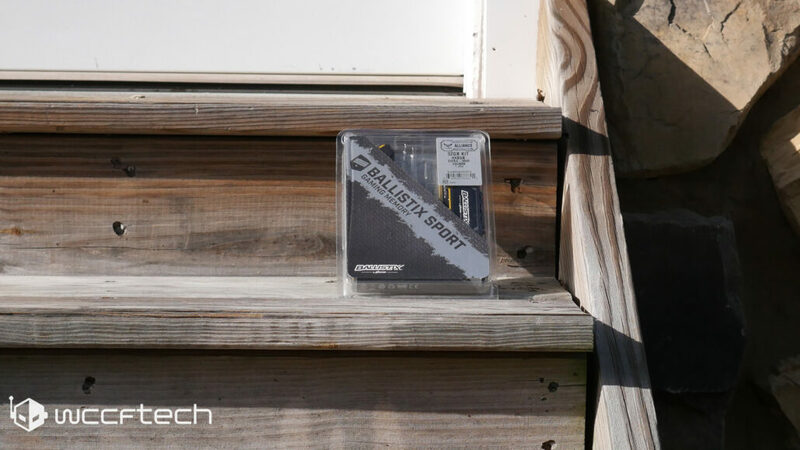 Today I will be looking at their newest entry in their Ballistix Sport line up with the AT TUF Gaming Alliance kit, while they have had their Tactical, and Elite models, the Ballistix Sport model aims at being the entry level enthusiast model, to fit the budget of any gamer. 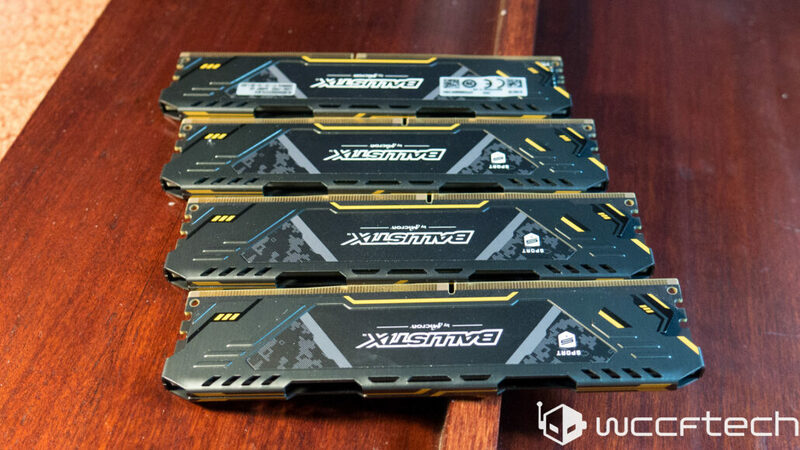 Though the kit we were sent is probably a bit out of the budget of most with it costing $403 its more than most gamers would likely budget on RAM. 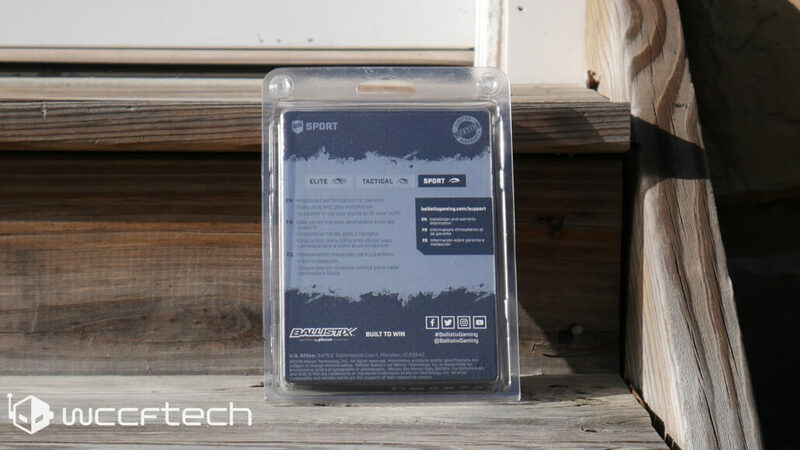 Crucial also is known for taking their time and testing their kits more than most other manufacturers and in general has some of the best QA in the industry. As well as how long they’ve been in the industry. 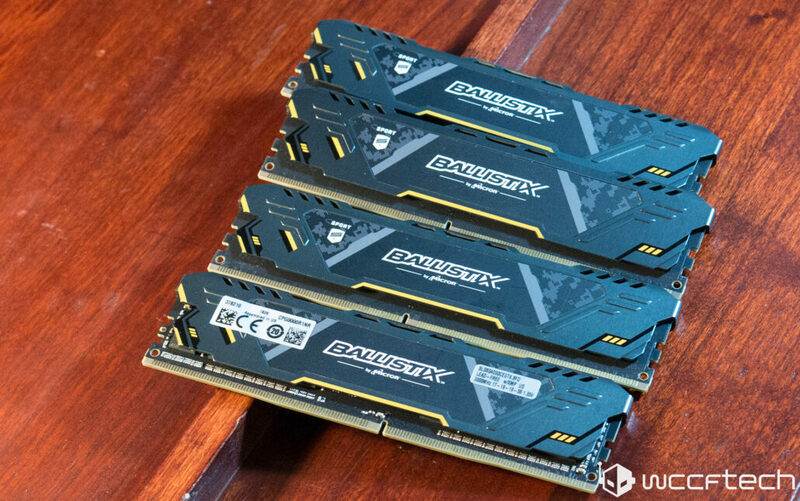 The Crucial Ballistix Sport AT 32GB DDR4 Memory kit has the following specs. 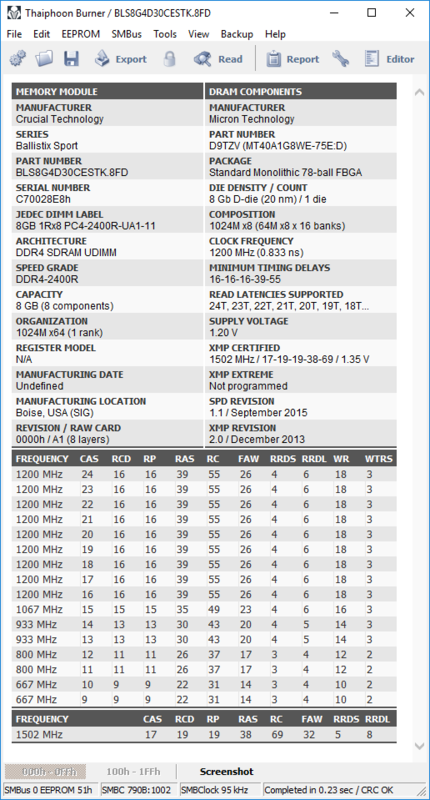 The kit we were sent has a rated speed of 3000MHz at a rather loose 17-19-19-38 at 1.35v they do have lower capacity kits at tighter timings, but we were sent the larger capacity kit. While it doesn’t feature a lot of the new crazes like RGB, it does have XMP (Which we didn’t use on our Ryzen system though we did use the timings as a guide) It packs a QVL which has been approved by ASUS in their TUF Gaming Alliance which first off means it has been designed with their aesthetics in mind. 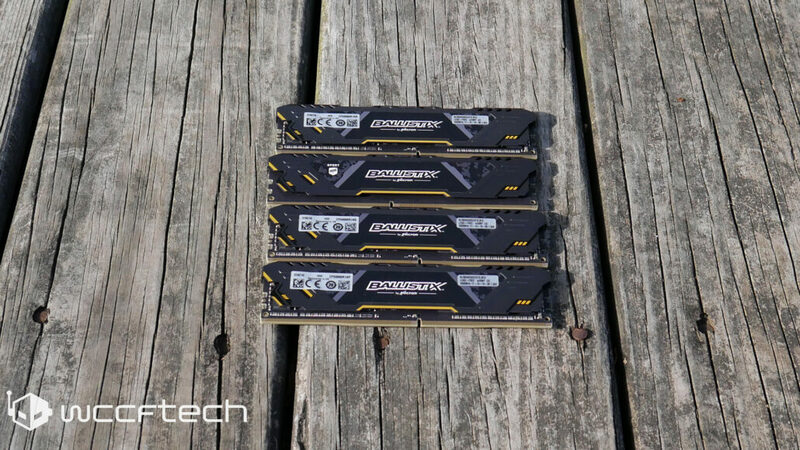 It also has a lifetime warranty for the product as most higher end RAM kits have nowadays. 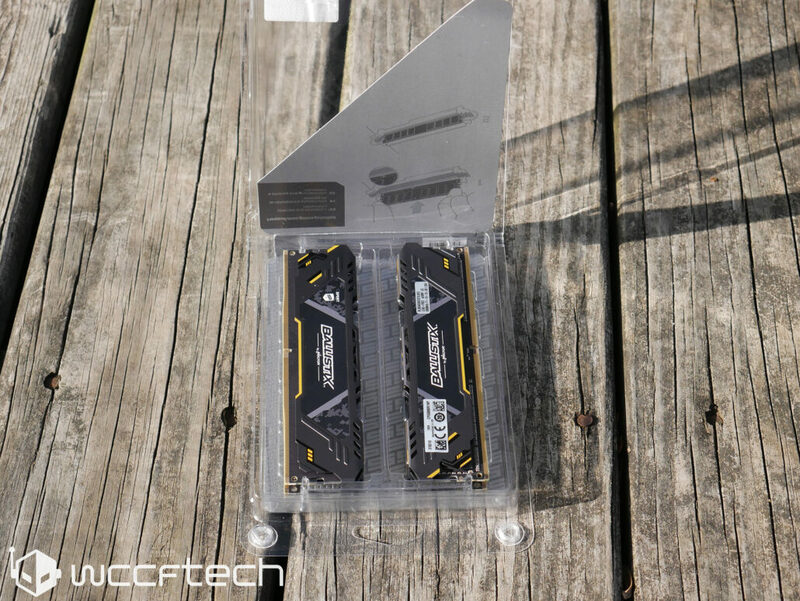 The Ballistix Sport AT TUF Branded kit comes in a simple clamshell plastic case design which flips open and has two stacks of kits layered on top of one another to maximize space efficiency. 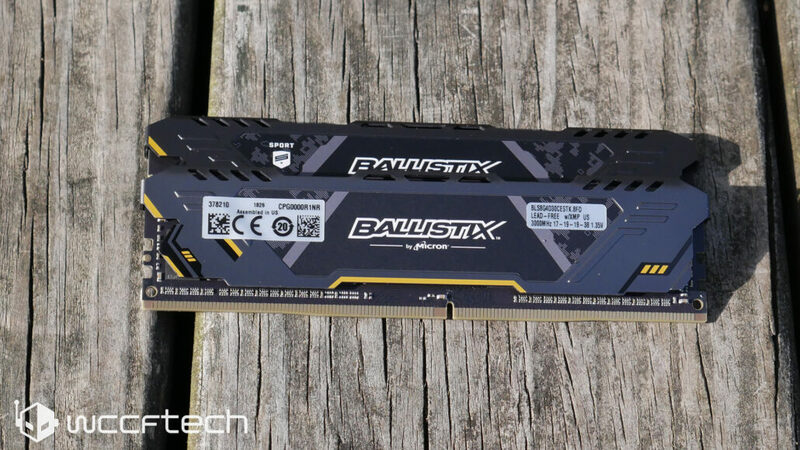 The packaging includes the Ballistix branding, as well as links to their social media and their limited lifetime warranty. The flap inside also includes instructions on installing RAM something which almost everyone here would know how to do but is nice for those new to the process. 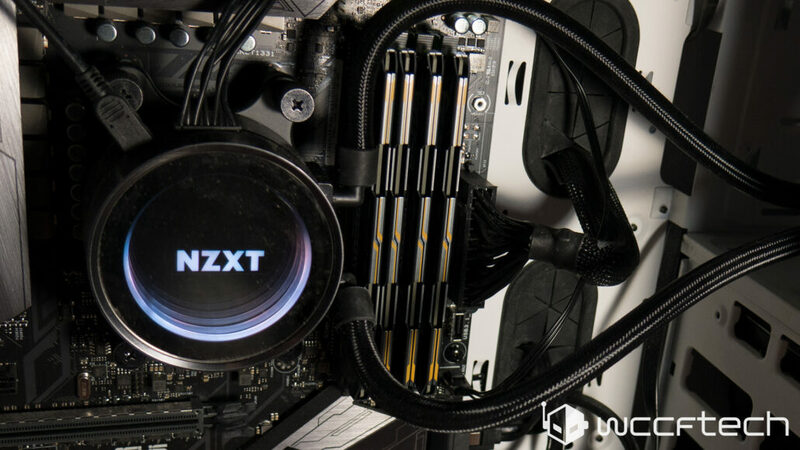 The kits have a bit of weight to them, which is good considering the heat spreader seems beefy enough to handle the job while remaining low profile in case you plan on using a large air cooler with similar TUF branding. 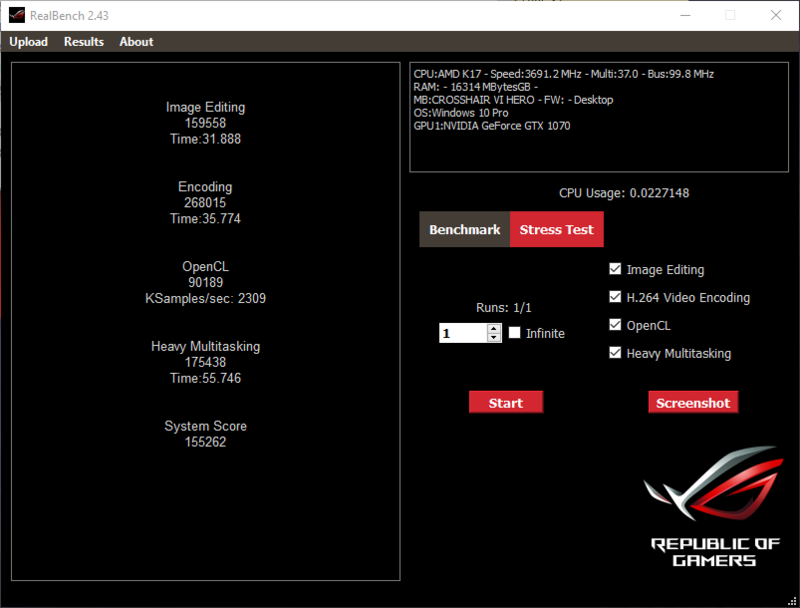 Taiphoon Burner is an application that allows custom flashing of RAM profiles and general tweaking to those who are so inclined. I have included the Typhoon Burner Data for those who are interested since users in the past at other websites have requested this data. 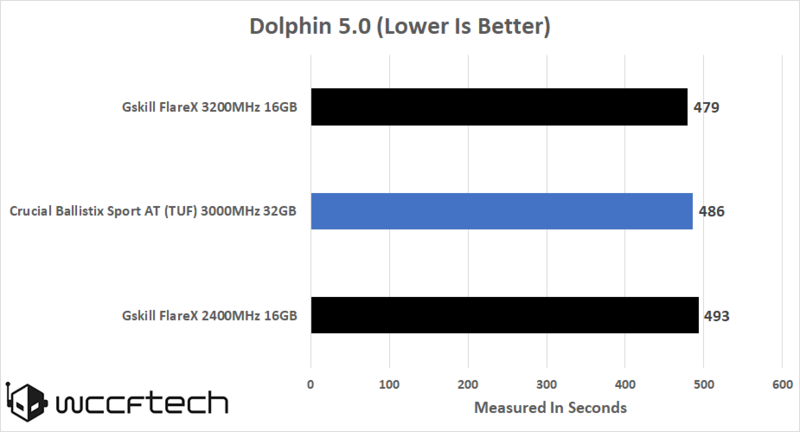 I have separated the performance tests into two sections in order to keep in line with our other memory reviews. The first section consists of pure synthetic and general workload tests while the second section would be focusing on gaming performance and how different games are affected by higher clocked memory sticks. 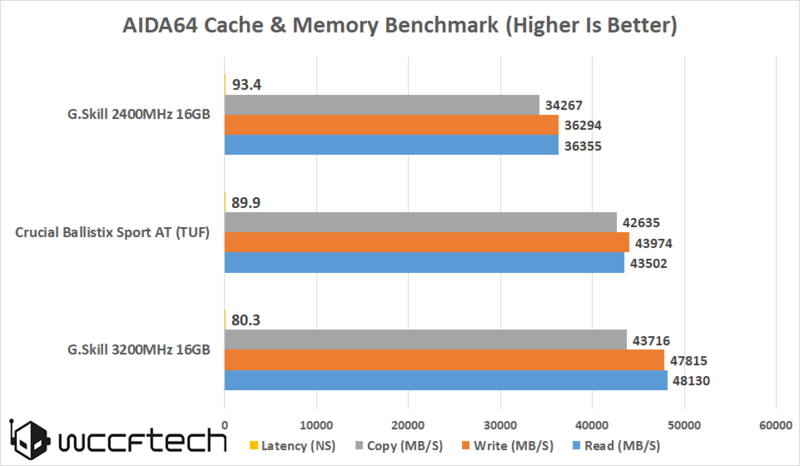 Aida64 has a built-in cache and memory benchmark which tests Copy, Write, Read and Latency performance. 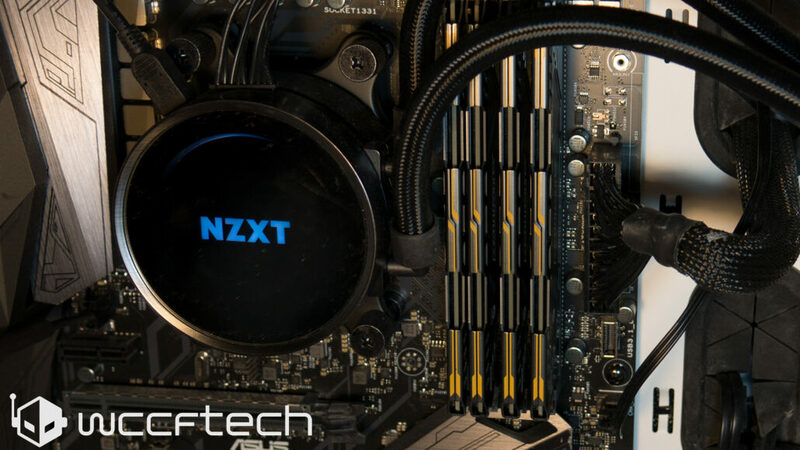 Here we can see that the Ballistix Sport AT kit, is a bit behind the kit configured at 3200MHz though when dropped to 2400MHz the Crucial kit takes the lead. Asus Realbench is an application that uses real open source applications to test the general performance of your PC in a variety of tasks but makes it easier for the layperson to get some quick and dirty results and has often been used to test if an overclock or tweaking has a noticeable effect on performance. Here we see more of the same, the Crucial kit clocked at 2933MHz is in-between the 3200MHz and 2400MHz configuration. 7 Zip is known as the open-source competitor to WinRAR and is one of the most widely used applications in the world. 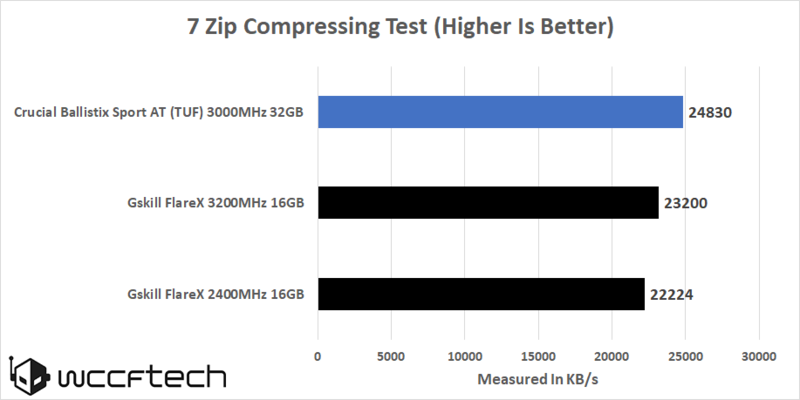 We see the higher capacity of the Ballistix Sport AT seems to have made a difference in the compression tests here which I can only assume has to do with the capacity since all the timings and the speed is lower than the G.Skill kit. 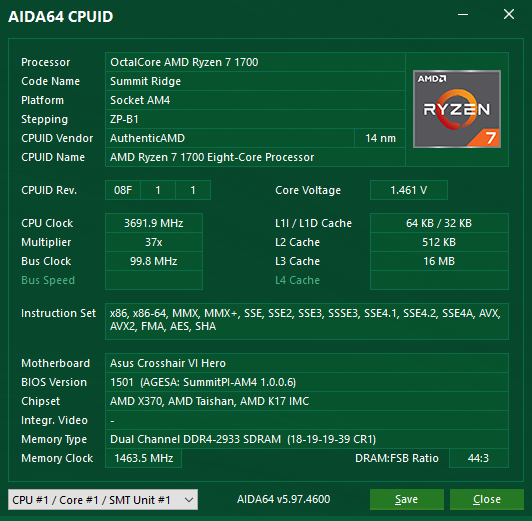 I will be using the same blender file used by AMD when they originally compared Ryzen to the 6900K we use 150 samples. 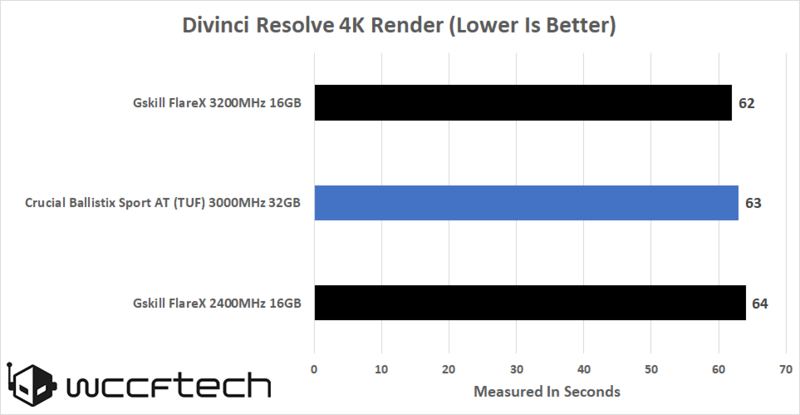 Divinici Resolve is a relatively underappreciated piece of video editing software used by editors on all major platforms due to its cross-compatibility between Linux, Windows, and OSX. 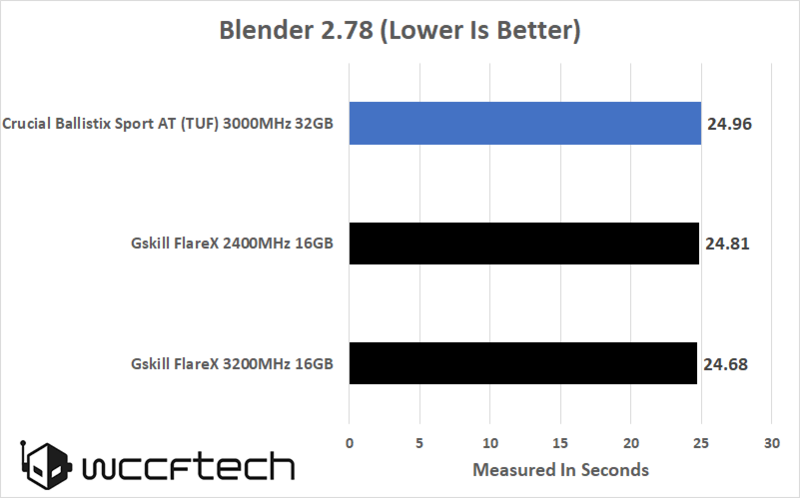 It is known for its high-quality color grading and high core usage compared to other applications that allows those with beastly systems to maximize performance. I test with a 1-minute movie trailer and 10 minutes of assorted Nvidia Shadowplay clips from my time playing PUBG cut up into a montage style. Overall we can barely tell the difference between these kits, and for rendering itself this wasn’t surprising in the least to me. 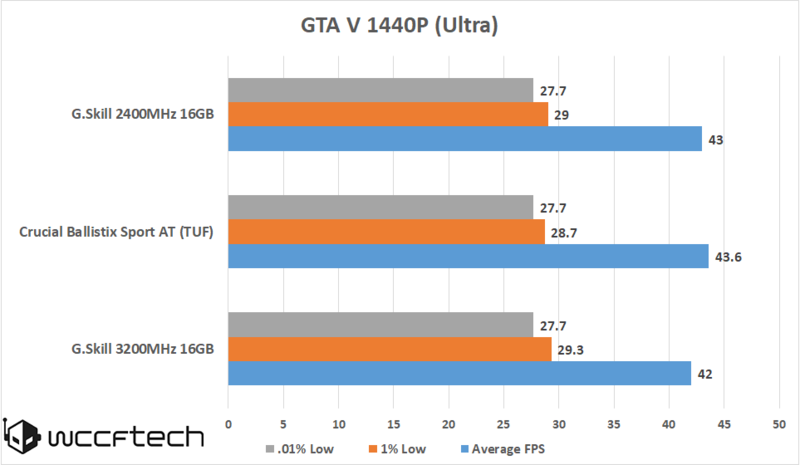 With the amount of VRAM in the GPU and the sizes of the files, I doubt I could fill 16GB if I tried, though I will say editing and working in the editor when scrubbing and the like was much better on the higher capacity Crucial kit. 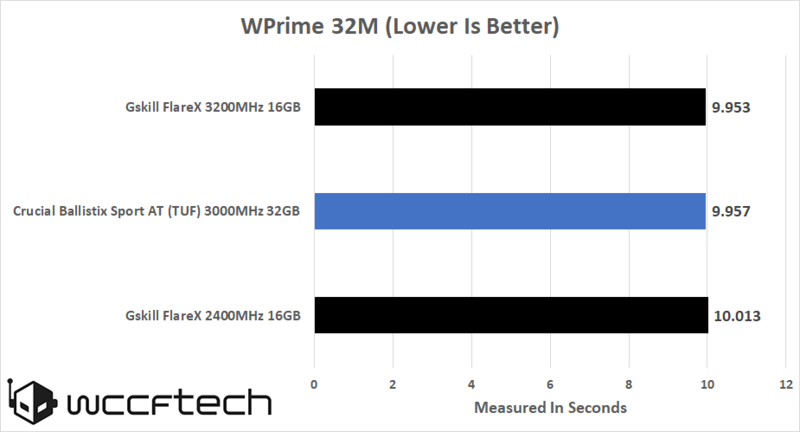 wPrime is a leading multithreaded benchmark for x86 processors that tests your processor performance by calculating square roots with a recursive call of Newton’s method for estimating functions, with f(x)=x2-k, where k is the number we’re sqrting, until Sgn(f(x)/f'(x)) does not equal that of the previous iteration, starting with an estimation of k/2. It then uses an iterative calling of the estimation method a set amount of times to increase the accuracy of the results. It then confirms that n(k)2=k to ensure the calculation was correct. It repeats this for all numbers from 1 to the requested maximum. 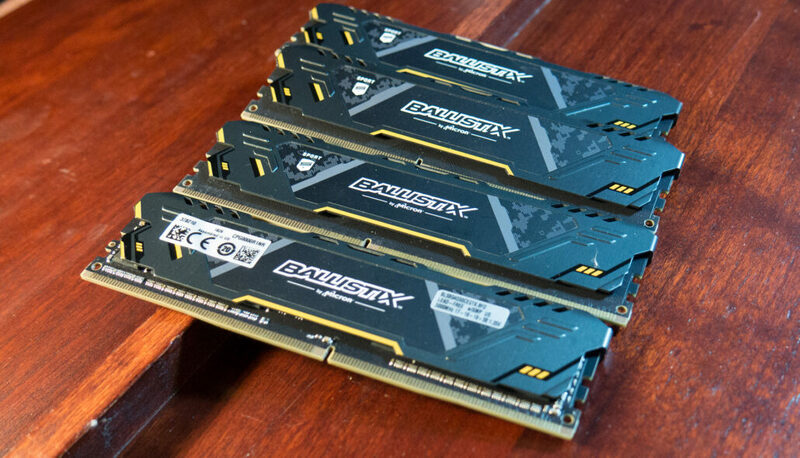 with this test, we see the maximum performance difference only remaining around 5% which seems to be a recurring theme with the Crucial Ballistix Sport AT 32GB kit. 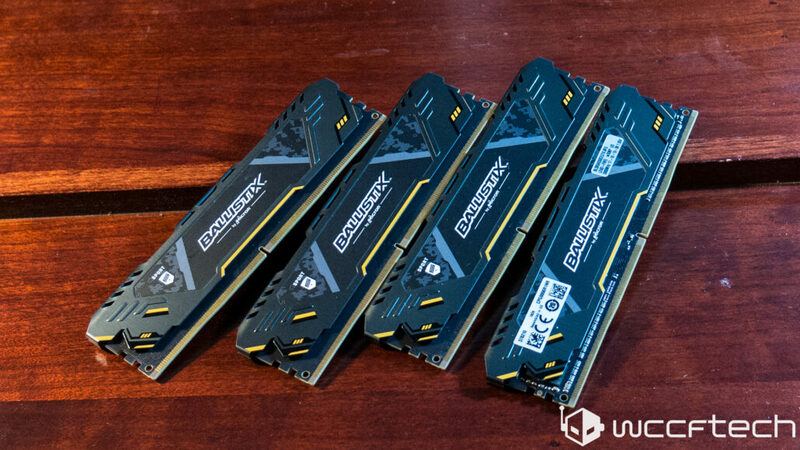 Gaming applications generally don’t see huge gains with different memory kits but DDR4 has enabled a huge gain in memory frequency which can impact gaming performance. 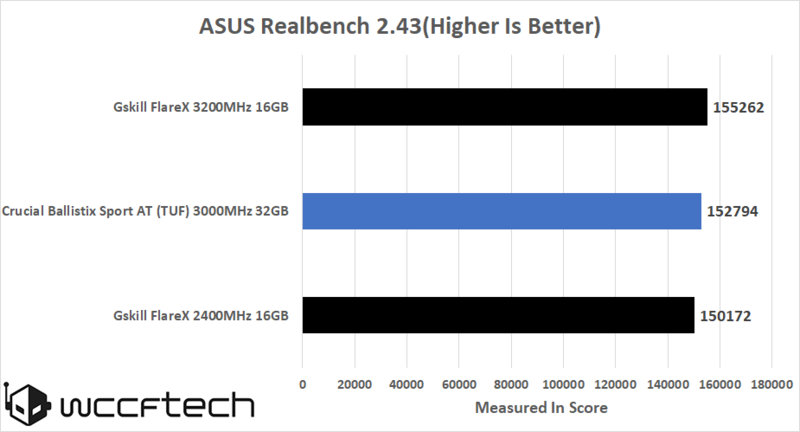 Especially on Ryzen Moving from the stock 2400 MHz to 2933 MHz is a big clock jump so we are eager to see what kind of general and gaming performance differences we get to see with that increase. Dolphin is a popular emulator of both the Nintendo Wii and Gamecube, this benchmark runs a Wii program that ray traces a complex 3D scene inside the Dolphin Wii emulator. 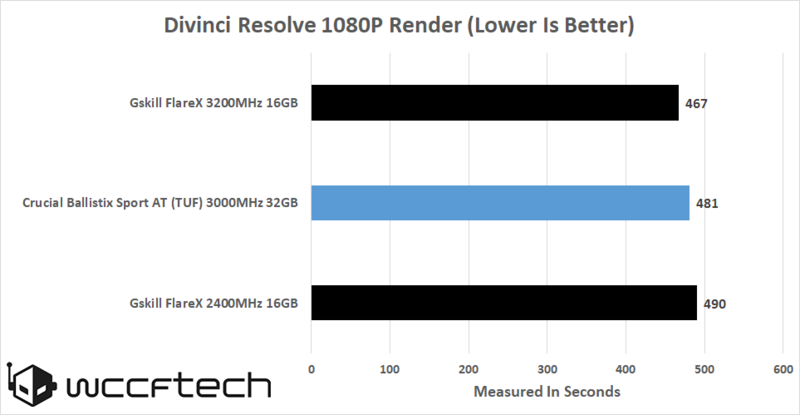 The Wii takes 1,052 to render the same scene as a baseline and is a good indicator of overall performance as well as emulator performance in lightly threaded applications. 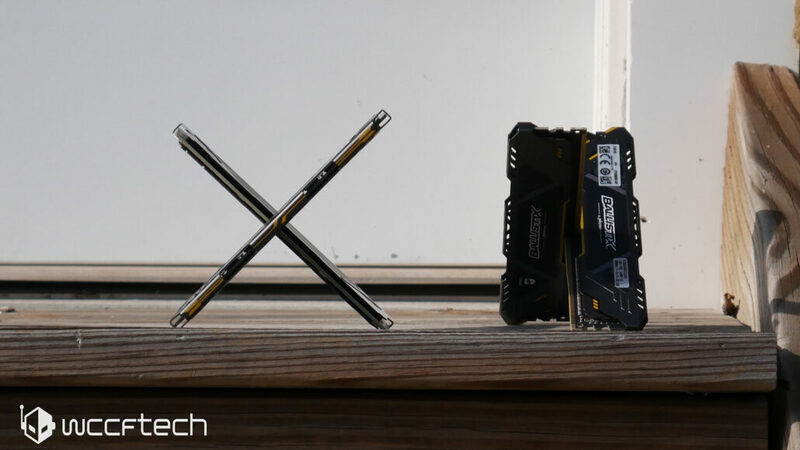 The difference in performance here is quite similar with it less than a 5% variation between the 3200MHz and the 2400MHz as well as roughly a 2% variation between the Crucial Ballistix Sport AT kit. 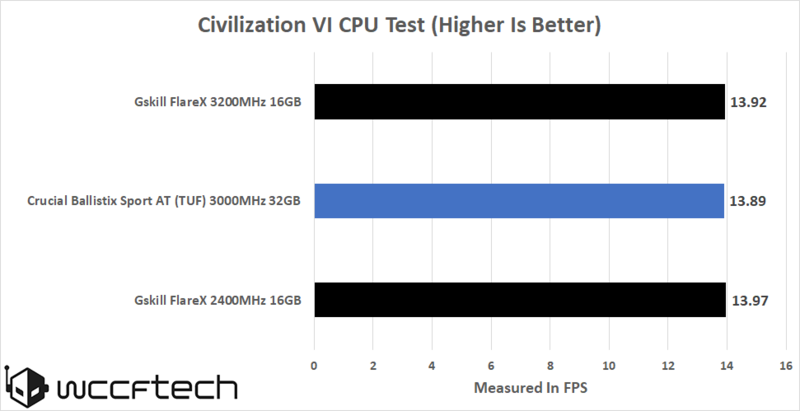 Civilization 6 is one of the most well known and played strategy games currently available, in the turn order test we test exactly how long it takes to go through a late-game turn. 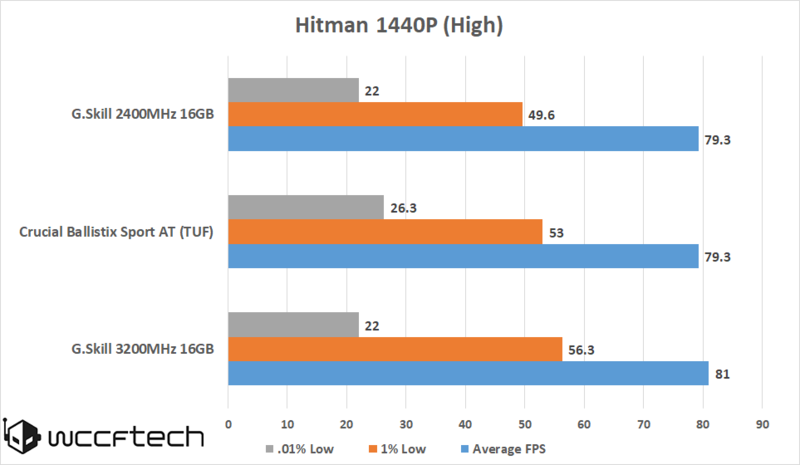 The reboot to the Hitman series was one of the top rated games in 2016 and is quite well optimized. For the benchmark, we run the automated benchmark from start to finish. 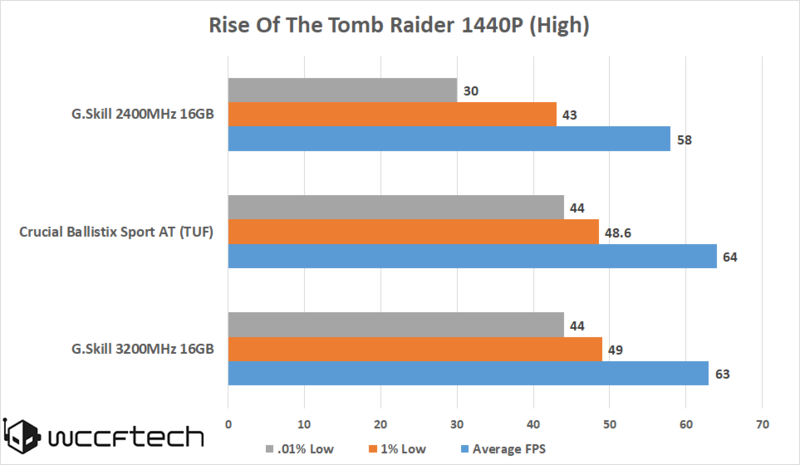 Rise of the Tomb Raider was the highly anticipated sequel to 2013 reboot of the well-known franchise. We test in the Geothermal Valley portion in a repeatable run through the valley. 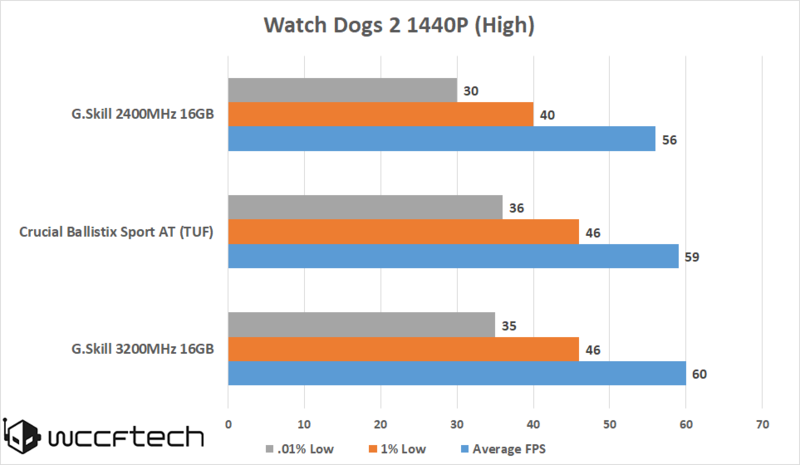 Watch Dogs 2 is the follow up to the original Watch Dogs game, it is a very well optimized port for the PC and is able to scale up to 16 CPU threads. We test in a 2 minute run through the bridge and in downtown Oakland on a motorcycle. 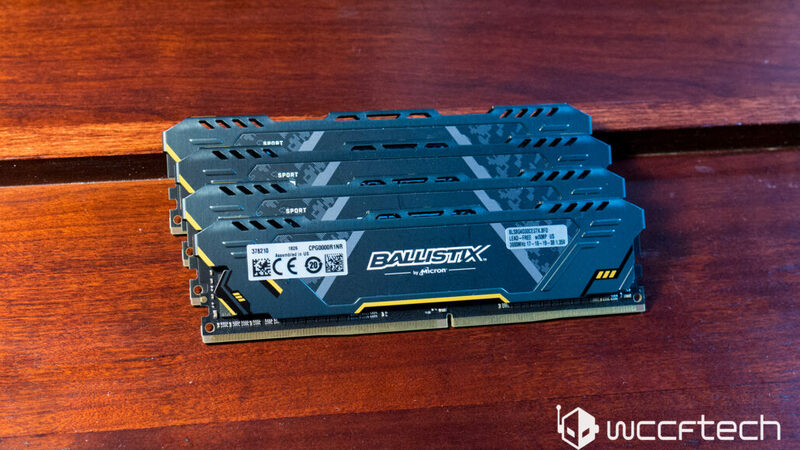 Overall tje Crucial Ballistix Sport AT is a pretty decent kit, if priced a bit high. Pricing on this product is the real thing keeping me from giving it a hearty recommendation, though it is a bit of a specialized kit designed for ASUS TUF motherboards, and it would look great in an ASUS TUF motherboard, but for the majority of people who won’t be using one, it still looks pretty nice especially in the era of everything RGB, for those who are seeking shelter from the disco-themed builds that are all the rage. 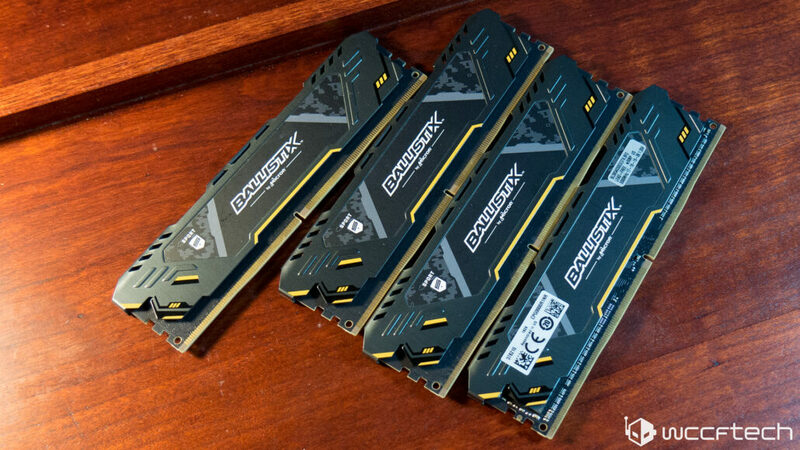 Though even with that said $403 is a lot to ask for 32GB of RAM even in this stage of memory shortage, One of the positives that I would say that this kit would look great in themed builds and has Crucial’s name and Micron’s backing behind it for warranty which is worth a good bit. 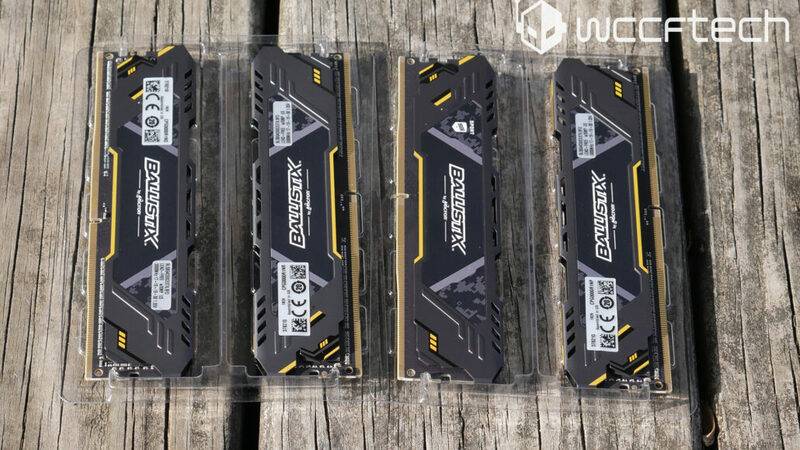 I still find it hard to recommend this kit specifically, the 16GB kits though seem pretty solid and might do well in an Intel system for the right buyer. 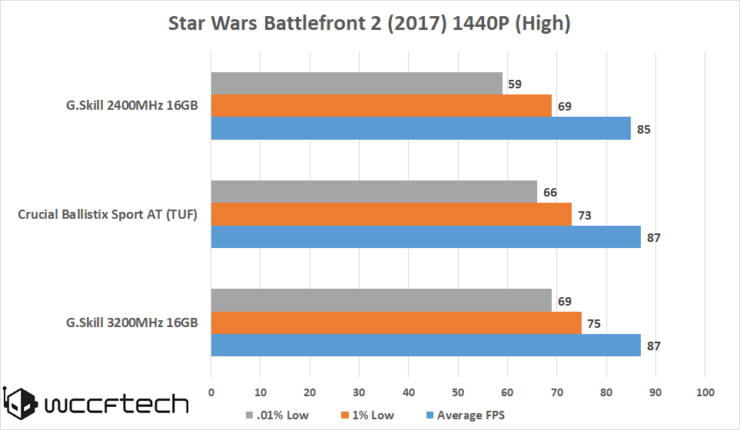 In most of the games test we saw a very small performance delta between the kits partly because I tried to use a higher resolution, to see if that makes any impact on RAM Capacity, which as you can tell it unfortunately did not. On Ryzen we would see a slightly higher gap with a better overclock or lower resolution. Normally the delta’s between a 3200MHz kit and a 2400MHz kit would be slightly larger. 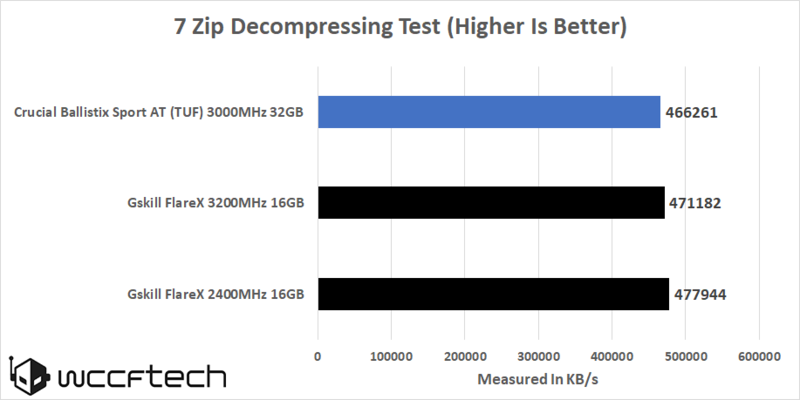 One think I noted in techpowerup‘s review is that the XMP profile on locked CPUs would result in a slight increase in core speed, which on the non-K SKU CPUs would generate a slight increase in performance. Those who are interested in that may consider picking one of these up just for that purpose in and of itself. 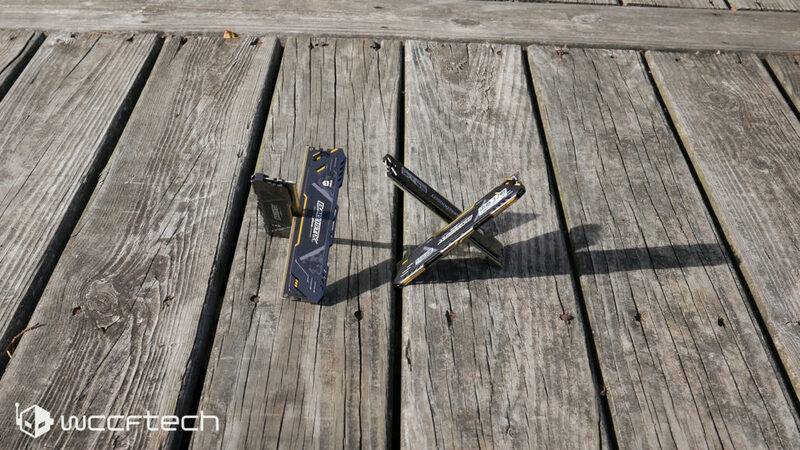 Overall a nice kit of RAM with solid design cues for ASUS's TUF lineup, but aside from that not much that separates it from other kits on the market. Those considering a TUF themed build should strongly consider, all others may want to look elsewhere. 32GB should fill the needs of almost all users with the exception of the most heavy power users. Pricing is about $60 too high to be competitive.